Check for updates when running Droid Transfer - Checking this box means that the program will automatically check for new updates. Add colour tint to control bar - modifies the colour of the bar at the top of the program window. Language - Select a different language from the dropdown and restart the program. Droid transfer will now be displayed in the new language. Default save path - this path will be used if you have chosen not to set a destination for each copy. General copy options - options which could save you time when copying files in Droid Transfer. General music options- whether or not to save album art when copying music tracks. Folder structure - how you would like Droid Transfer to save tracks in folders to your computer. 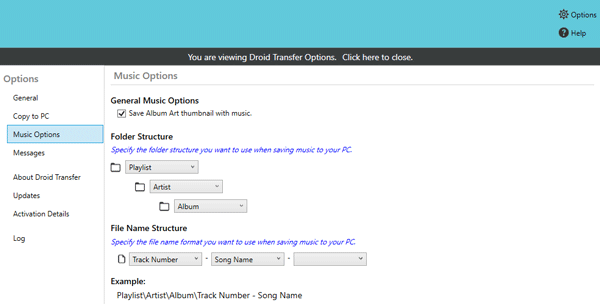 File name structure - how you would like Droid Transfer to name your music files when saving to PC. Limit options - Limit the messages shown in the preview window to only messages sent past a certain date. Contacts - how you would like messages to be ordered and displayed in Droid Transfer. Here you can find the version of Droid Transfer that you are currently running. If you should require support for this product, our staff may ask you for this number. A manual check for updates to the software. This tab displays your Activation code, email address used on activation, the date you activated the software on this computer and when your activation licence expires. From here, you can also deactivate the licence on this computer so that you can activate Droid Transfer on a different computer. Scary Code! Don't worry about this tab. This is only needed if you have a problem with the software, and our support staff ask for the log. The log will provide insight to our developers as to the issue at hand.